In 1932, Wartenberg described five cases of isolated neuropathy of the Superficial Radial Nerve (SRN) . He was so impressed by the similiarity to the isolated involvement of the lateral cutaneous nerve of the thigh, Meralgia Paraesthetica, that he suggested the name Cheiralgia Paraesthetica. The condition is sometimes referred to as Wartenberg's Disease, although Wartenberg was not the first to draw attention to it. He cited the early accounts of other authors in his description. The SRN is the superficial sensory branch of the radial nerve. After the radial nerve bifurcates into the SRN and Posterior Interosseous Nerve (PIN), the SRN courses distally into the forearm deep to the brachioradialis. 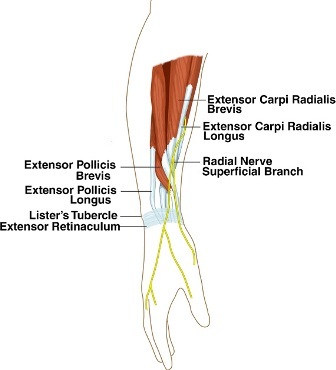 Approximately 9 cm proximal to the radial styloid, the SRN becomes a subcutaneous structure by traveling between the brachioradialis and Externsor Carpi Radialis Longus tendons. The SRN continues to travel in the subcutaneous tissues and branches out into dorsal digital nerves responsible for afferent sensory input from the dorsum of the thumb, index, and middle fingers proximal to the proximal interphalangeal joints. The SRN can be compressed at any point along its course in the forearm, but it is believed to be at greatest risk at the posterior border of the brachioradialis as the nerve transitions from a deep to a subcutaneous structure. Trauma is also a common etiology for SRN compression, which can occur from direct pressure on the nerve (i.e. by a wristband or handcuffs) or from a stretch injury to the nerve (i.e. during a closed reduction of a forearm fracture). Patients with SRN compression typically report pain or dysesthesias on the dorsal radial forearm radiating to the thumb and index finger, although the distribution of symptoms may vary owing to differences in anatomy. When such sensory disturbances present concomitantly with weakness of the PIN-innervated muscles, the clinician should consider alternative diagnoses, such as a more proximal lesion (of the cervical spine, posterior cord of the brachial plexus, or radial nerve proper) or perhaps a mass in the radial tunnel large enough to affect both the PIN and SRN. Because irritation of the SRN often occurs in the region of the first dorsal compartment, SRN compression symptoms may be confused with the symptoms of de Quervain’s tenosynovitis owing to pain with ulnar deviation of the wrist. One principal difference between the two conditions is that patients with SRN compression tend to have symptoms at rest, independent of the position of the wrist and thumb. SRN compression and de Quervain’s tenosynovitis may in fact both be present simultaneously. A positive Tinel’s sign over the course of the SRN is the most common physical examination finding, although the clinician should be mindful that this may also be positive in patients with more proximal pain generators, such as a lateral antebrachial cutaneous neuritis. Finkelstein’s test may be misleadingly positive as the thumb does not have to be flexed to elicit a positive test. Patience is the cornerstone of therapy in patients with SRN compression symptomatology because spontaneous resolution is common. As external compression is a common underlying etiology, removal of the inciting element such as a wristwatch or bracelet is an essential component of nonsurgical management. Additionally, rest, splinting, and nonsteroidal anti-inflammatory drugs are appropriate first-line treatments. Owing to the subcutaneous location of the SRN, a number of noninvasive therapeutic modalities centered around peripheral nerve stimulation (PNS) have been studied for the treatment of nerve pain, including pulsed low-intensity infrared laser, as well as direct electrical stimulation. The use of PNS to treat neuropathic pain is based on the gate control theory of pain. Although this theory has found support in the medical literature and is certainly intriguing, there is mixed evidence supporting the use of PNS. Some studies have shown no measurable effect from laser stimulation, but others have demonstrated alterations in the cortical evoked potential latency and amplitude, suggesting that stimulation of peripheral nerves suppresses nociceptive processing. Certainly, more clinical research is warranted to determine the precise role of PNS in the treatment of SRN compression. The role of corticosteroid injection is less clear. Lanzetta and Foucher (1993)  reported a 71% success rate in 29 patients who underwent conservative management alone, which was defined as removal of a tight watch strap, splinting, and, in 3 cases, a corticosteroid injection. Lanzetta and Foucher (1993) reported 74% success rate in 23 patients who underwent surgical decompression who had failed conservative therapy or whose symptoms were longstanding and had no distal progression of a Tinel’s sign. Surgical decompression may also be indicated in posttraumatic situations in which scar tissue may be the critical compressive factor. There is evidence in the literature documenting the anatomical variations of the SRN or muscles which demands the thorough knowledge and examination before administering treating especially surgical decompression. The knowledge of anatomic variations of brachioradialis, especially about the position and attachments of additional slips of its split tendon, is important during differential diagnosis and surgical decompression of the SRN. It should be noted that there are no randomized controlled trials examining the efficacy of different types of conservative regimens (compared with one another or with surgical decompression) in the management of Wartenberg’s syndrome. ↑ Sudarshan SURENDRAN,Seetharama Manjunatha BHAT ,Ashwin KRISHNAMURTHY;Compression of radial nerve between the split tendon of brachioradialis muscle: a case report:Neuroanatomy; 2006; 5: 4–5.